JUNEAU — Gov. 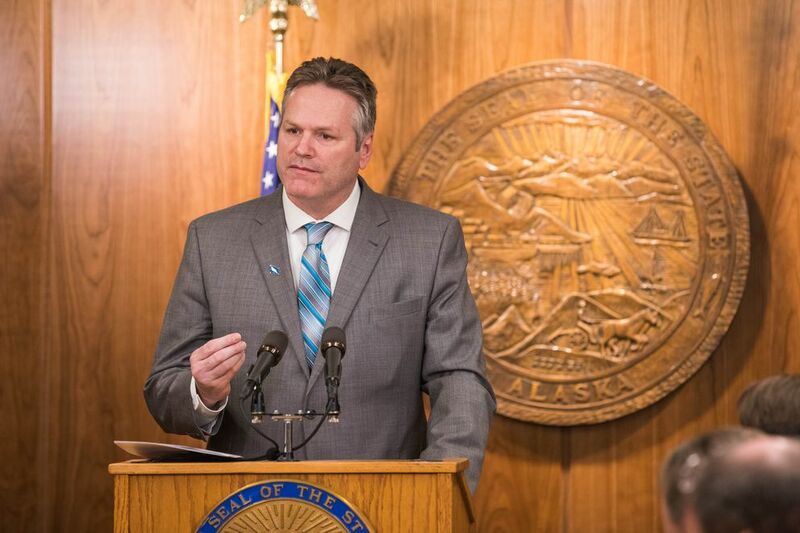 Mike Dunleavy introduced a plan Wednesday to pay a supersized Alaska Permanent Fund dividend this year, but the amount of that larger dividend will be less than some Alaskans had expected. Under the governor’s plan, Alaskans would receive more than $4,000 this year, next year and in 2021. That’s the amount of the dividend under state law, plus a supplemental payment equal to the amount cut by Gov. Bill Walker and legislators in 2016, 2017 and 2018. To be eligible for the bonus, you must have been eligible for the dividend in the year it was cut and the year it will be paid. “If you qualify for a dividend this year and you qualified for a dividend in 2016, that amount will be included in your dividend this year,” Revenue Commissioner Bruce Tangeman said, explaining the process. The same procedure would take place in 2020 — anyone eligible for the dividend in 2017 and 2020 would get the bonus — and 2021 (for those eligible in 2018 and 2021). Recipients would get one check for both the traditional dividend and the bonus payment. Dunleavy proposed the notion of back payments during his campaign for governor, but the assumption had been that he would pay them in one lump sum this year. “I think the general concept was everybody was going to get it this October,” Tangeman said. Speaking at a news conference in Juneau, the governor said he believes it is critical to pay a “full” dividend to restore trust in government. “When we campaign on commitments, you have to fulfill those commitments, and when you have laws in place, you should follow those laws,” he said. While the Alaska Supreme Court has ruled that Permanent Fund Dividend payments are appropriations subject to change, Dunleavy has a different interpretation and believes a formula set in state law represents an obligation by the state to the people of Alaska. Back payments would fulfill that obligation. The governor’s plan must be approved by the Legislature before it happens, and the co-chairs of the Senate Finance Committee said they may be reluctant to approve it. To pay his supersized dividend, at the high end of estimates, the governor would need to spend $2.3 billion from the Alaska Permanent Fund between now and 2021, according to figures provided by Tangeman. That would mean “less money to earn money” in the accounts of the Permanent Fund, said Sen. Natasha Von Imhof, R-Anchorage and a co-chair of the Senate Finance Committee. Last year, the Alaska Legislature approved Senate Bill 26, which establishes rules for spending from the Permanent Fund. If the Legislature follows those rules — and investment earnings match projections — the Permanent Fund will continue to grow while sustainably generating money for a dividend and general government expenses. The bill leaves the amount of the dividend up to lawmakers, and while the Legislature has not yet decided, Dunleavy has proposed spending $1 billion under the Senate Bill 26 rules for general government expenses and $1.9 billion for a dividend of about $3,000 per Alaskan. The proposal unveiled Wednesday would violate the Senate Bill 26 rules, which is a concern for Von Imhof and fellow finance committee co-chair Sen. Bert Stedman, R-Sitka. Violating the Senate Bill 26 rules means risking the fund’s long-term value: Future dividends could be smaller and the fund could contain less money in the future for other expenses, though the final result will depend on the performance of the fund’s investments. Speaking Tuesday, before the introduction of the governor’s bill, Stedman said, “We’ll be very protective of the earnings reserve,” the portion of the Permanent Fund from which the governor’s plan would be paid. He reiterated his support for protecting the Permanent Fund on Wednesday. Asked what conversations he has had with lawmakers about his proposal, the governor said the introduction of his plan in Senate bills 23 and 24 will open that discussion. He said he believes the idea has bipartisan support and “I think in the end, the Legislature will do the right thing,” he said.